The soothing blues, whites and grays of the ocean surf. The outdoor boardwalk cafes. The seashells, sea horses and sand dollars. What’s not to love about the beach? If you are planning a baby shower we guarantee that the fun and creative ideas for a beach themed baby shower are endless. So grab your sun tan lotion and your surfboard and bring the beach to your next event. We have gathered some cool beach themed baby shower decoration ideas that are sure to wow all of your party guests and give the mommy-to-be have a day she will never forget. Set the entire tone for the party with this adorable catch of the day welcome sign. We love that it can be done with just a simple chalk board and can be customized for boy vs. girl with the Mommy’s name and any other fun details you would like to add. If you don’t have a surfboard of your own, borrow one from somebody who does. The background design isn’t the important part…you can just cut out foam or paper letters to spell out BABY or the baby’s name on the front for a fun decorative piece. This adorable beach chair cake is the perfect centerpiece for your beach themed baby shower dessert table. It’s so cute we almost don’t want to eat it! 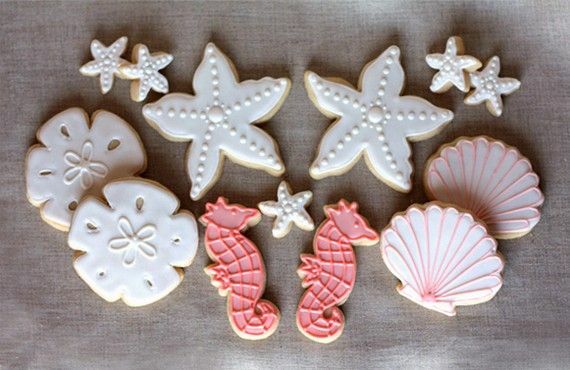 Decorate your dessert table with these cute starfish, sand dollar, sea horse and sea shell cookies. These are a cool and yummy way to bring the beach theme to your party. These mini-candy jars can be easily labeled to create a fun party favor which incorporates the colors of the ocean. What better way is there to let your guests take the beach vibe home with them. 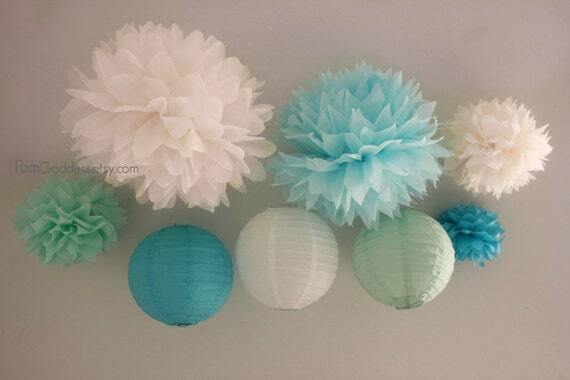 When you are looking for beach themed baby shower decoration ideas then blue, white, green and gray pompoms and Chinese lanterns are a great way to create the perfect ambiance throughout your entire event. Tissue paper tassels are one of the easiest DIY decoration projects you can do to spruce up any event. For your beach themed baby shower simply gather ocean colored tissue, rubber bands and string and hang them all over your event. Who knew that crushed up vanilla wafers would look so much like sand? This is a super cool way to bring the beach to your dessert table. Feel free to spread that sand underneath your ocean cookies too! We love this idea of letting your guests create their own fruity drink concoctions. Pick the freshest fruit of the season and decorate mason jars to use as drinking glasses. So fun! Customize a banner with the baby’s name, your choice of colors and any number of ocean-themed images like starfish, sea horses, shells and more. This would look cool hanging in the entryway, on the mantle or over your dessert table. Before you get started with your baby shower decorations, make sure to check out our baby shower invites at Oubly to set the tone for your event.